Reminder: Animal Therapy Tomorrow from Noon to 1PM! Just a friendly reminder that it’s time for pet therapy! 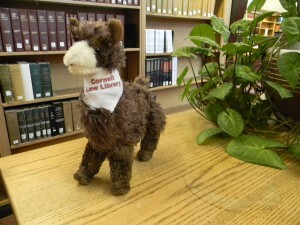 Stop by the Student Lounge tomorrow, April 28, from Noon-1pm, to unwind with therapy dogs and a llama. This is also the perfect opportunity to enter a drawing to win Lloyd the Llama, pictured to the right. This event is co-hosted by the Cornell Law Library and Cornell Companions.